Maximum food safety, best quality and sustainability have always been our prerequisites. Our certifications are checked and confirmed every year by independent institutions. 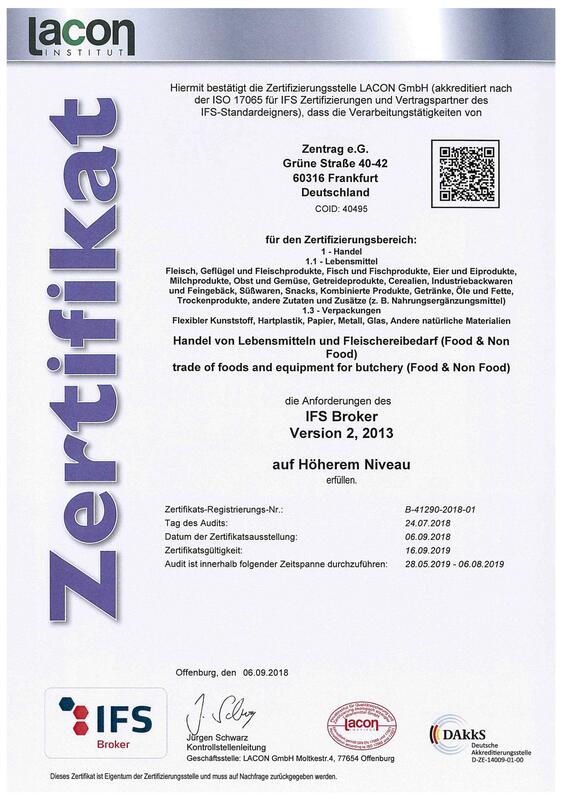 In 2018 ZENTRAG eG has been certified again with the quality and food safety standard IFS Broker. ZENTRAG obtained for the sixth time in a row the best possible rating at the IFS Certification 2018 „Higher Level“ and even improved the result by 0.33% in comparison to the previous year. IFS-Standards such as the IFS Broker are developed for and with all the participants in the supply chain, to ensure product safety and quality and to close the gaps between production and logistics. IFS Broker or International Featured Standard Broker is a standardised procedure for the certification of the quality management of trading companies – an absolute prerequisite for being allowed to supply the food retailers. This procedure based on the rules of the International Food Standard shall ensure the quality of foodstuffs in the food retail trade, the health of consumers and the quality level of suppliers. Good to know: the IFS-certification becomes an ever more important competitive advantage for our member cooperatives and economic organisations too. That is why we at ZENTRAG eG have concluded a frame agreement with the certification company, so that our members can benefit from these attractive conditions for their own certification. Since 2007 ZENTRAG eG is also certified with the Organic-Food Certificate (BIO) for processed foodstuffs. The service providers we engaged, QAL GmbH until 2014 and Lacon GmbH since 2015, are independent and neutral certification companies. The organic label stands for environmentally sound and animal-friendly production methods. The criteria for the awarding of the label are based on the EU legislation for organic farming. Species-appropriate animal keeping: Feeding of the animals with ecological food. Livestock should have access to open-air or grazing areas. Organic products can be traced back to the producer. Licensed supervisory authorities check at least once a year the whole production site. Only producers, processing and import companies complying to these (and more) requirements and undergoing the prescribed audits are entitled to sell their products under the label „organic“. ZENTRAG eG continues to participate in the voluntary traceability system for beef by ORGAINVENT GmbH. ORGAINVENT GmbH sees itself as the link between agriculture, food trade and state agencies. This support and control of traceability at the different trade levels assures you as buyer a high information quality. ZENTRAG participates regularly in product quality tests conducted by DLG (German Agricultural Society). The DLG product tests provide the consumer with neutral and independent results on the quality of foodstuffs. In December 2017 the Gilde cocoa has been awarded a gold medal.